64/169 Max Braden This is a decent action piece and remake, but nothing beats a classic. Confession time: I have not seen the original Red Dawn but once, upon its release on videocassette in the mid-1980s. I recall being freaked out by the scenario, but let’s be honest. I was eight. The world at large seemed to be an infinitely scary place, what with all this talk about nuclear annihilation, stand-offs with the Soviet Union, and an ever-increasing number of movies concerned with the graphic depiction of the physical and emotional damage that would be wrought in the aftermath of World War III. Whether it was fictional or breaking news on the Today Show, all systems seemed to indicate, “Go! End of World!” Even tucked away in a woody enclave as I was, and being a relatively well-adjusted and even happy kid, I think I soaked in a lot of this paranoia and barely-controlled hysteria and it kept me worried. 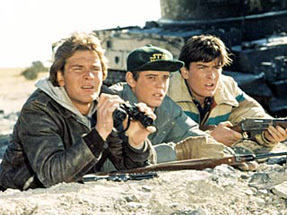 Red Dawn is as much an artifact of this time as any Cold War-related feature, but with just enough of a nightmare twist to keep it somewhat relevant and make it more than the “Brat Pack makes Commies see Red” dis that a plot synopsis might suggest. As helmed by John Milius - whose resume encompasses writing and/or directing credits on testosterone-fueled projects as far-flung as 1941, Apocalypse Now, Conan the Barbarian, and the TV series “Rome” - Red Dawn has lingered in the public consciousness perhaps because it was conceived by someone with a sense of vision, rather than a B-level action director looking for a drive-in sized hit. None of which goes any further towards explaining if a Red Dawn remake is needless, pointless, or just really misguided (outside of possibly making some accountants happy.) MGM doesn’t have a lot on its plate franchise-wise these days, and what can one do but zip through the studio archive list from A to Z and see what can be touched up and made shiny and new? With an announced budget of $75 million (or twice what the original grossed! ), it seems that the Studio that Roars will not be skimping on explosions and action, but what will it all amount to? The current economic/political/cultural climate may actually play into the film’s favor and those tired of having dramas about the Iraq War and the war on terrorism “forced” upon them may rejoice at once again having a fantasy conflict in which the USA is the wronged party and we can rise up and defeat a common enemy. And who is the invading nation this time around? China. (It must be hard for writers of action films what with so few international go-to villains left that are politically correctly permissible and who still might conceivably want to slap us around.) The setting has been moved from Colorado to Spokane, WA and the leader of the teens fighting back is a hometown boy just returned from a tour of duty in Afghanistan. With his combat training, he militarizes the group, which includes his younger brother, the high school football team’s QB, to rise up against the invaders and in doing so become a beacon of inspiration from sea to shining sea. Or something to that effect. Much as the original can now boast of having future stars Patrick Swayze, Charlie Sheen, C. Thomas Howell, Jennifer Grey and Lea Thompson in its ranks, this year’s model is stacked with up-and-comers who may have “future sitcom star” stamped on their forehead. Chris Hemsworth stars as the elder brother. He has played Kirk’s dad and is filming Thor and the Joss Whedon hor-com The Cabin in the Woods so his star is already set to ascend. Josh Peck - the QB - has moved steadily up the children’s programming ranks in the last decade (The Amanda Show, Drake and Josh, two of the Ice Age movies) so this marks his induction into the ranks of teenage action hero. And the female lead, that of the quarterback’s kidnapped girlfriend, goes to Isabel Lucas, last seen looking all kinds of glassy-eyed dead as she attempted to do unspeakable robot things to Shia LaBeouf in Transformers: ROTF. Oh yes, and Tom Cruise’s son Connor stars as well. Maybe next he and Jaden Smith can team up for a remake of a 1990s TV show? See the latest developments for this project on the Red Dawn Movie News page.